July 17, 2011 - no comments. Posted by Larz in Events, Trading Cards. 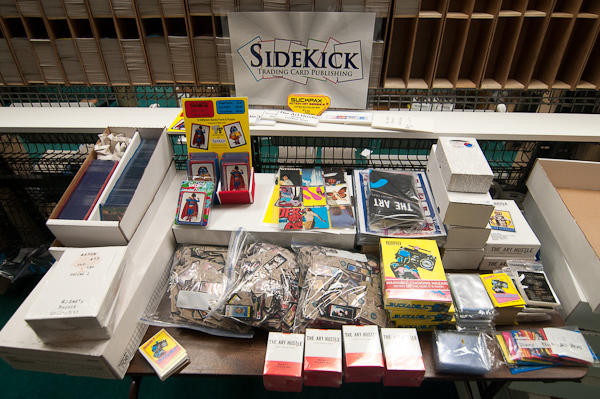 SideKick will be at SDCC! A look at the stuff we will be packing to bring to the Con. We have several different cards, and events, at the show. 4 different cards embossed with a 2011 SDCC gold foil seal will be given away to those who ask for them, available at DKE Toys booth (#4728 in the Toy section). A different card will be given out each day. 2 of them are Promo cards, and 2 are part of the regular numbered series, and have not been released to the public yet. These are not part of Series 2, but instead are the next 2 cards in numeric sequence. A special set of cards, available through ToyTokyo (booth #5437) exclusively. These are a mini set, with 2 different fronts and 3 different backs. Artwork is by Ron English, “Superboy” and “McSupersized”. The 8 different backs form a puzzle of another Ron English artwork. Ron English and Morgan Spurlock will be at the ToyTokyo booth at various times during the show for signing. We have a guest slot at a booth, 5pm Saturday booth #4397, where we will give out promos, and have for sale Suckpax and The Art Hustle cards. I will be roaming the show the rest of the time. I will be posting photos on http://www.sidekicklab.com in the evenings (as time and energy allows).